Due to the long time Almorávide menu takes, it’s only served until 14:30hrs for lunch and until 21:30hrs for dinner. From January 30th to June 15th 2019, both included. In accordance to the Organic Law 15/1999 of personal data protection and the Royal Decree 1720/2007 of development of it, we inform you that with the purpose to manage your reservation and sending all the commercial information about products and services, specifics personal data are required, which can be handled and incorporated to the restaurant files. The personal data delivery constitutes the express consent to handling them. In order to safeguard the security of your personal data, technical and organizational security measures will be implemented, as the Real Decree 1720/2007 demands, that regulates the security files in which personal data are contained. The personal data required are the suitable, relevant and strictly necessary for the purpose: managing your reservation, and sending comercial information about products and services. Likewise, you certify that all the personal data you provide us are truthful, veracious and pertinents for the finality they are asked for. At any time you can exercise your rights of access, rectification, cancellation and opposition prescribed by the law according to the legal procedure determined, by means of a signed writing accompanied with an ID copy address to the directorate of the restaurant, or by means of electronic email to the restaurant email address. We consider that if you do not cancel expressly your personal data from our files, you are still interested in being included to them until the restaurant considers. In compliance with article 10 of Law 34/2002, of July 11 on Information Society and Electronic Commerce Services, the identifying details of the company are shown as follows. The source, graphics, images, photographs, sounds, animations, software, texts, as well as the information and contents contained in this website are protected by Spanish legislation on intellectual and industrial property rights in favour of PAMOGA GASTRO S.L., and reproduction and / or publication of all or part of the website is not allowed, neither can it be computer processed, distributed, disseminated, modified, transformed or decompiled, or other legally recognized rights of the owner, without the prior written consent thereof by PAMOGA GASTRO S.L. The user may only and exclusively use the materials which appear on this website for personal and private use, being their use for commercial purposes or in illegal activities prohibited. All rights under intellectual property are expressly reserved by PAMOGA GASTRO S.L. PAMOGA GASTRO S.L. shall ensure compliance with the above conditions such as the proper use of the contents presented in its website, exercising all civil and criminal actions that may apply in case of infringement or violation by the user of these rights. As part of compliance with current legislation included in Organic Law 15/1999 of December 13 on the Protection of Personal Data (LOPD), which aims to guarantee and protect, concerning the processing of personal data, freedoms and fundamental rights of individuals, and especially their honour and personal privacy, PAMOGA GASTRO S.L. informs users that this website has sections where personal data is requested and recorded. B.- PAMOGA GASTRO S.L. can modify, without prior notice, the information contained in its website, as well as its settings and presentation. C.- PAMOGA GASTRO S.L. undertakes through this means NOT TO MAKE MISLEADING ADVERTISING. For this purpose, therefore, formal or numeric errors that can be found throughout the content of the various sections of the PAMOGA GASTRO S.L. website produced as a result of incomplete or faulty maintenance and / or update of information contained in these sections may not be considered as misleading advertising. PAMOGA GASTRO S.L., in accordance with the provisions of this paragraph, undertakes to correct this as soon as it becomes aware of such errors. D.- PAMOGA GASTRO S.L. undertakes NOT TO SEND ADVERTISING CORRESPONDENCE WITHOUT IDENTIFYING THEM AS SUCH, in accordance with the provisions of Law 34/2002 on Information Society and Electronic Commerce Services. For this purpose, information sent TO THE CLIENTS OF PAMOGA GASTRO S.L. shall not be considered as advertising information, provided its object is to maintain the existing contractual relationship between the client and PAMOGA GASTRO S.L. and the performance of the tasks of information, training and other activities of the service that the customer has contracted with the company. E.- PAMOGA GASTRO S.L. shall not be held liable for the breach of any applicable rule that may be incurred by the users’ access to this website and / or use of the information contained therein. F.- PAMOGA GASTRO S.L. takes no liability for damages caused or likely to occur, whatever their nature, arising from the use of information, the matters contained in this website and the programmes included. The links and hypertext which enable Users to access features and services offered by third parties through this website are not owned or controlled by PAMOGA GASTRO S.L. ; such company is not liable for the information contained therein or for any effect that might result from such information. G.- PAMOGA GASTRO S.L. takes no liability for the illegitimate use by third parties of brand names, product names and trademarks, which are not owned by such company but appear on this website. Neither will it be liable for the integrity, veracity and legality of the content of links to websites which can be accessed from this website. H.- Ultimately, users will be solely responsible for the use made of the services, content, links and hypertext in this website. Moreover, I give my consent for transferring my personal data to companies with which PAMOGA GASTRO S.L. may collaborate to improve their services either in Spain or abroad, provided that the Spanish legislation on personal data protection is observed. The data provided by users to PAMOGA GASTRO S.L. will be true and accurate. Users will also be solely responsible for any direct or indirect loss or damage that may be caused to PAMOGA GASTRO S.L. or any third party in case of breach of these terms. PAMOGA GASTRO S.L. guarantees the confidentiality of personal data provided by users and collected through its server. PAMOGA GASTRO S.L. will control the file where personal information provided by users is stored, and has all the facilities to ensure the safety and security of their information systems as well as customer data stored therein. When a mandatory data collection procedure is initiated, refusal to provide such data will imply the non-provision of services for which they were requested. There will be a possibility to provide information voluntarily to improve our services. When the email address of users is required to access any of our services, you may state you do not wish to receive any advertising communications from PAMOGA GASTRO S.L. that are not necessary for the purpose of the requested service. PAMOGA GASTRO S.L. will provide Users registered on a mailing list with the necessary means to unsubscribe. The use of services offered in this website by minors must be previously authorized by their parents, guardians or legal representatives as they are considered responsible for all actions performed by minor children in their care. A cookie is a file that is downloaded to your computer to access certain web pages. Cookies enable a website, among other things, to store and retrieve information about the browsing habits of users or on their computer, depending on the information they contain and on the way they use their computer, and can be used to recognize the user. What types of cookies are used by noorrestaurant.es and their websites? Noorrestaurant.es websites use “cookies” and other similar mechanisms (hereinafter, Cookies). Cookies are files sent to a browser by means of a web server to record User activities on a particular website or all websites, apps and / or services of the Websites of noorrestaurant.es (hereinafter, the Services). The primary purpose of Cookies is to provide Users a faster access to the selected services. In addition, Cookies customize the services and advertising you see on the noorrestaurant.es websites, facilitating and offering each User information that is or may be of interest to you, according to the use you make of the Services. Registered Users who register or who have logged in may benefit from a more personalized service oriented to their profile, thanks to the combination of data stored in the cookies with personal data used at the time of registration. Such Users expressly authorize the use of this information for these purposes, without prejudice to their right to reject or disable cookies. 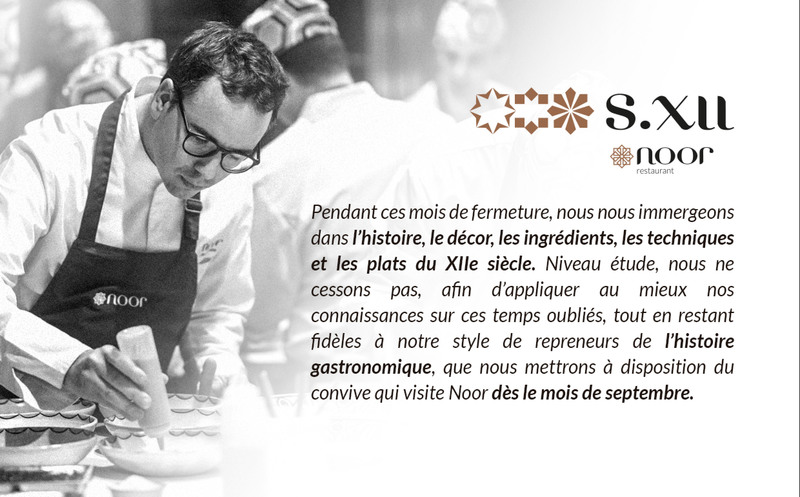 Moreover, the websites of noorrestaurant.es will know all noorrestaurant.es Services requested by users, in order to facilitate or offer adequate information to the tastes and preferences of each user. Cookies, in terms of their stay, can be divided into Session or Permanent Cookies. The former expire when the User closes the browser. The latter expire depending on when the purpose for which they serve is achieved (for example, to keep the User identified in the Services noorrestaurant.es) or when manually deleted. Keep the User identified so that, if you close a Service, the browser or computer and you re-access at another time or another day, the Service will remain identified, thus facilitating browsing without having to identify yourself again. This function can be deleted if the User presses the button “logout”, so that this Cookie is deleted and the next time you enter the Service, the User will have to log in for identification. Additionally, some services may use connectors with social networks such as Facebook. When Users log into a Service with social network credentials, they authorize the social network to keep a persistent cookie that remembers your identity and ensures access to the Services until it expires. Users can delete this Cookie and revoke access to the Services through social networks updating your preferences in a specific social network. GEOLOCATION COOKIES: These cookies are used by programmes that attempt to geographically locate your connected computer, smartphone, tablet or TV, in order to totally anonymously offer content and better services. Allowing the anonymous identification of browsing Users through the “Cookie” (identifies browsers and devices, not people) and hence the approximate counting of the number of visitors and their trend over time. Anonymously identify the most visited and therefore more attractive content for Users, and knowing whether the User who is accessing is a new or repeat visit. Important: Unless the User decides to register for a Service of noorrestaurant.es the “Cookie” will never be linked to any personal data that can identify you. Such Cookies will only be used for statistical purposes to help optimize Users’ experience of the site. ADVERTISING COOKIES: This type of “Cookies” allow increase the information of advertisements displayed to each anonymous User of noorrestaurant.es Services. Among others, the duration or frequency of display of advertising positions, interaction with them or browsing patterns and / or User behaviour are stored as they help shape a profile of advertising interest. Thus, they enable offering advertising related to the interests of Users. THIRD PARTY ADVERTISING COOKIES: In addition to advertising managed by the Websites of noorrestaurant.es in the Services, the Websites of noorrestaurant.es offer advertisers the option to serve ads through third parties (“Ad-Servers”). Thus, these third parties may store Cookies sent from the Services of noorrestaurant.es from the browsers of Users and access the data stored in them. How to disable Cookies on the main browsers? It is normally possible to stop the browser from accepting Cookies, or stop accepting Cookies from a particular Service. All modern browsers allow you to change the Cookies settings. These settings are normally found in “Options” or “Preferences” in your browser menu. You can also set your browser or email manager and install free add-ons to prevent Web Bugs to be downloaded when you open an email. For more information, please consult the Microsoft support or Browser Help. For more information, please consult the Mozilla support or Browser Help. For more information, please consult the Google support or Browser Help. For more information, please consult the Apple support or Browser Help. Some features of the Services will be disabled, for example, remaining identified and receiving information at your location. Noorrestaurant.es websites may modify this Cookies Policy based on laws, regulations, or in order to adapt the policy to instructions given by the Spanish Data Protection Agency, which we advice Users to visit regularly. In case of significant changes in this Cookies Policy, these will be communicated to the Users either through the web or by email to registered Users.